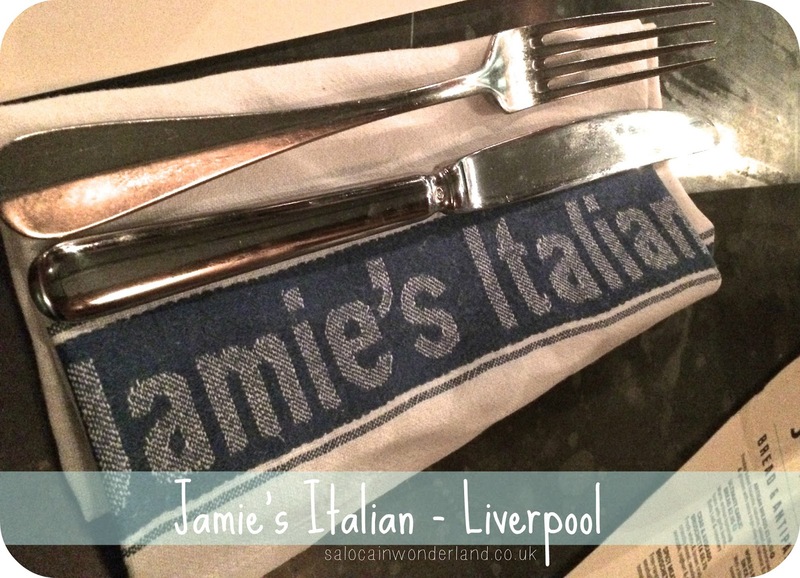 Nestled amongst the hustle and bustle of Liverpool One you’ll find Jamies Italian. With a love for all things Italian; the passion, family, lifestyle, and of course, food, Jamie Oliver set out to create a restaurant with an authentic Italian flavour and atmosphere, where good food and good times come top of the menu. I headed down on a Saturday night with the Mr and our friends, we had a table booked for 7 pm, good job as there was no way we would have managed to snag one just wandering in off the street. The place was packed, with servers running round, cocktails mixing and cutlery clanging and oh, the smell of sauces and spices filtering through the dimly-lit restaurant from the open kitchen at the back. We grabbed some drinks at the bar (did someone say a litre of rose?) and were seated within 15 minutes of arriving - pre-booked table win! The menu’s not super extensive but I like that. I always say when it comes to food, choose a few things and do them well, instead of bombarding people with anything and everything and only doing a slapdash job on each item. Steaks, pasta, fish, burgers and comforting Italian favourites cooked just how you like. Our server was an absolute star and I feel awful we didn’t catch his name, he really went all out for us. My friend actually has a nut allergy and as soon as we mentioned this he did everything he could to ensure all our dishes would be nut free and allergy friendly. For starters, I had had my eye on the Italian Nachos. Nachos that didn’t actually involve nachos, but, Crispy fried ravioli. The ravioli was stuffed with mozzarella, ricotta and Bella Lodi cheese served with a nice and spicy Sicilian tomato sauce. These went down a hit on our table, they were so unexpected and so good, really crispy on the outside but oozy and cheesy on the in. We also ordered some Free Range Pork Scratchings - I’ve never seen these on a menu before, they’re a pub snack to me so I was really intrigued as to how Jamies would jazz them up. Served with a spicy apple sauce (think flavour, not heat) they were actually really good! For mains, I went with the Gennaro’s Famous Porchetta; slow-cooked pork belly filled with garlic, chilli and herbs with root vegetables, spiced applesauce and salsa verde. The pork belly was bursting with flavour with a very subtle hint of chilli, the pork itself fell apart and the outer fat was really crunchy. The chunky root veggies and apple sauce were really nice, the only downside was there just wasn’t much of everything. Of all our meals, mine was the smallest and I probably could have done with ordering a side to go along with it. Both boys went for Jamie’s Italian Burger; juicy prime British beef with mortadella, balsamic noons, tomato, provolone, pickles and chillies, this burger was huge. The waiter even dropped off some steak knives as most people tend to cut it in half. One thing I will say is that it was greasy, not a big deal for some but there was grease dripping out with every bite they took. Grease aside they both said it tasted great and was full of flavour. It was an extra £3 for fries, one got chilli fries which were pretty disappointing and plain, the other got funky chips which were great! Seasoned with garlic and rosemary, the flavour was really strong. My friend went for one of the daily specials, a Lamb Ragu; nut-free assured, shredded lamb in a rich ragu sauce on a bed of pasta. I did have a sneaky taste of the lamb and it was divine, full of flavour and such a huge portion size. If you ask me, there’s always room for dessert. 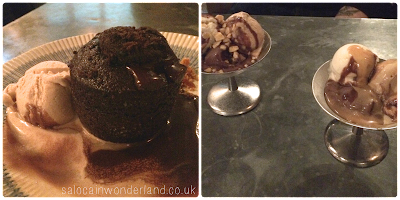 I went for the Molten Chocolate Praline Pudding; a warm chocolate sponge with a liquid praline centre with a side of salted caramel ice cream. As soon as my spoon pulled apart the sponge the praline oozed out and mixed with the ice cream, it was the perfect sweet treat. Our friends both went for ice cream, a scoop of each flavour on offer; vanilla, chocolate and salted caramel with a mixture of chocolate and butterscotch sauce. I do love a create-your-own. Well, if you're not salivating all over your keyboard right now - what’s wrong with you? I’m getting hungry just writing this post. We had such a fantastic evening at Jamies Italian, from the atmosphere to the service and the really great food. Price wise, it’s not as expensive as other nearby restaurants and most of what was coming out of the kitchen looked damn good. Yes, my meal was a little on the small side, but let’s be honest here, I’m a greedy bugger. I’d definitely head back to Jamies Italian, especially in the summer. I can just see myself sitting outside watching the world go by whilst nibbling on an antipasti board and sipping sangria. 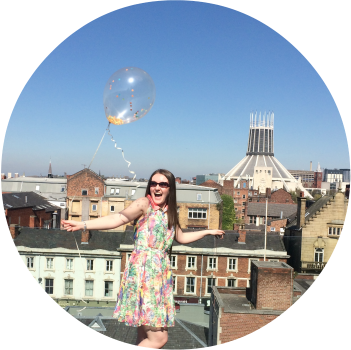 I might not be able to go to Italy anytime soon but Jamies has brought Italy to my little corner of Liverpool. Jamies Italian kindly provided a part payment for our meal in exchange for this review. All thoughts and opinions are 110% my own :) For more information, see my disclaimer here. Yumm! The snaps here all look amazing. 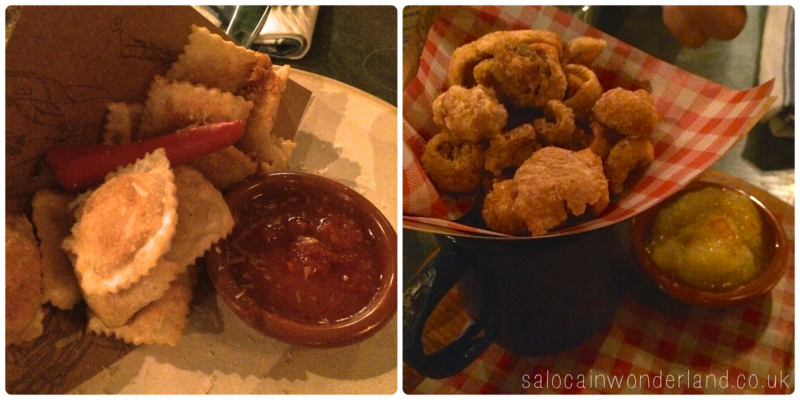 I've really enjoyed Jamies Italian the couple of times I've been, definitely need to try and get there again! Oh my! That chocolate cake dessert looks so yummy! Everything does! Is pizza an Italian dish!? Lol probably not the American NY style pizza but that has to be my favorite Italian dish lol!